Imagine wearing this short black wedding-guest dress with gleaming floral embroidery to your next semi-formal event. The delightful party dress features a sheer overlay with vibrant embroidered flowers that contrast beautifully against the black lining. As unique as it is lovely, this party dress has a one-shoulder detail that adds a contemporary vibe to the form-fitting sheath dress. A side slit completes the look as it draws the eye to the modest knee-length hem of this little black dress. 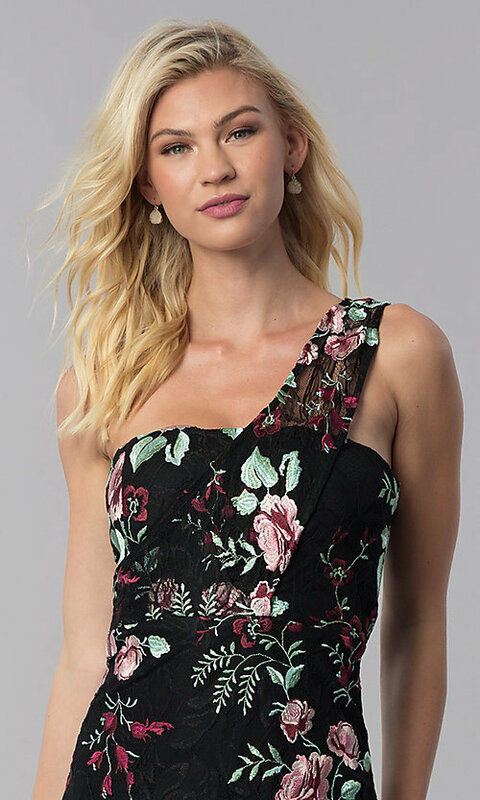 Great for cocktail parties and family celebrations, this short black wedding-guest dress is a gorgeous design that is hard to ignore.